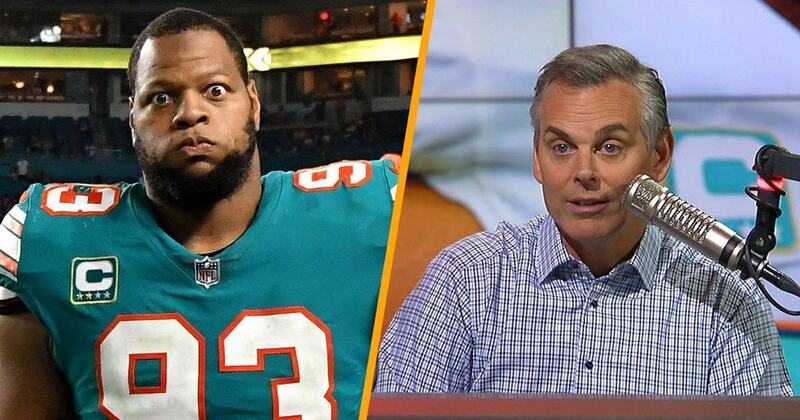 Deleter News | World - Sports - Politics | Colin Cowherd details why Jared Goff is the big winner if Ndamukong Suh lands in L.A.
Colin Cowherd details why Jared Goff is the big winner if Ndamukong Suh lands in L.A.
- Here's a story that is close to breaking-- Ndamukong Suh and the LA Rams. Now this is like, wait a minute, he's expensive, they don't need him. Here's what-- now he's the last big domino to fall in free agency. Most of the good guys, Adrian Clayborn gobbled up, some running backs gobbled up. So what is happening here? The winner's Jared Goff. OK, Aaron Rodgers has been in this league as a starter 10 years, never had a defense like this. I don't think Peyton Manning, before we got to Denver, he never had a defense like this. OK, most quarterbacks in their career never get a defense. They got Aqib Talib, Marcus Peters, Aaron Donald, Suh, other safeties Johnny Johnson was all-rookie team last year at Boston College and then Lamarcus Joyner, I think's the other safety. I mean, I'm not even counting the offensive people. I'm not counting Gurley, Woods, Kupp, I'm not counting Whitworth, the left tackle, John Sullivan. This defense with Suh? again, you see, they don't need him. There's always room for good players, OK? It's all about salary. Here's why this is happening- it's a copycat league. Jared Goff, they're paying him a nickel for the next two years, he's on his rookie deal. This is what Seattle did. When they were paying Russell Wilson nothing, they went and overspent on Percy Harvin and Cliff Avril. This is what Philadelphia did because their paying Carson Wentz to Nick Foles nothing. They went and got Torrey Smith, the running back from Miami, Alshon Jeffery got a one year, massive deal, Ronald Darby. Look at the cap hit in the NFL for quarterbacks. Garoppolo will cost the Niners $37 million, Andrew Luck $24, Drew Brees $24, Ben $23, Brady $22, Matt Ryan $22, Cam Newton $21, Aaron Rod-- Jared Goff cost them $7 million, that's why they can do this. This is exactly what the Eagles did last year. The Eagles are like, we're paying our quarterbacks nothing so we can just give Alshon Jeffery a massive, one year deal. Ronald Darby, Torrey Smith make a deal with the Dolphins on a running back, LeGarrette Blount. This is what Seattle did when they got Russell Wilson in the third round. I mean, they could just-- Percy Harvin barely played. In fact, he was finally good in the Super Bowl, and Cliff Avril. You get these little, tiny windows when you get a quarterback on his rookie deal and he pops. Like in year two, oh, oh, we can win the Super Bowl with him. Oh, he's pretty good. You got to do what the Rams are doing, what the Eagles did, what the Seahawks did. You go all in for two years. Because by the way, in two years Goff's going to be at $29 to $33 million cap hit. And guess what? You're going to be down to Cooper Kupp at wide receiver and a Dixie cup. You're not going to have like seven receivers, OK? You're going to be down to one good receiver and drafting receivers. That's the reality of it. So look at Seattle's offensive line, one Russell Wilson made money what happened? They got a bad, ol' line, they have no running backs, they just gave away a receiver-- just gave away Michael Bennett. Philadelphia's got a couple more years in this baby and they're striking when the iron's hot. But in two years when they got to pay Wentz a fortune-- Philadelphia, you're not going be able to even play in this game. So this is exciting. I like what the Rams are doing, I don't think he's an ideal fit. And also Jay Glazer came on this show and told us something. It's a copycat league and everybody's looking at a team that did this last year and it worked. - Last couple of years, free agency's been a bad game of fantasy football. Guys whose names are big, who are getting overpaid-- and you just don't win that way. You don't build-- and a lot of teams realized that. They're like we're not doing this, we're not going and throwing a boatload of money at Ndamukong Suh's and all those guys. It's not a huge type of market because it just doesn't work that way. You have to build through the draft and you have to, smartly, go get an Andrew Whitworth that you know is going to help the quarterback and the off-- right? Great one, right? That's the type of guys you need. But then all of a sudden, the Philadelphia Eagles happened last year. And the Eagles went out and they got guys like Alshon Jeffrey and the Chris Long's and then they traded for Jay Ajayi. They almost played this game that has become taboo-- and all of a sudden Philly had success with it and that's why you see all these teams this year, they have changed their ways. They're like, oh, because it's a what have you done for me lately league. - I totally agree with Jay, it's hot now, but I do think it started with Seattle. When Seattle loaded up in that brief Russell Wilson we're paying him what a Seattle DJ makes window, you just go in for two years. And you know, you can say what you want but it makes Pete Carroll a legend. College titles, Super Bowl title. This is where legends are made. Brian Billick can always walk in and say, got me a Super Bowl. He's going to be football talking job for life. So Les Snead, Sean McVay, Stan Kroenke and the Rams, this is why they're doing it, it's why Philadelphia did it and it paid off.